We are one of the trusted names in Independent hearing healthcare in Scotland. With over thirteen years of service, we will deliver best in class hearing aids to you in the comfort of your own home across The Lothians, North Ayrshire, Glasgow, Edinburgh, Perth, Dundee, Forth Valley, Tayside, Fife & The Borders. Interested in The Latest Hearing Aids in Scotland? We can undertake hearing aid repairs for all makes. The Hearing Aid Advice Centre can have hearing aids repaired of any age at a reduced cost compared to the high street hearing aid retailers. There are a number of retailers who will only repair hearing aids up to 5 years old, we however will repair hearing aids of any age (subject to a visual inspection). We offer hearing aid repairs for all types and brands. Age and use can take their toll on hearing aids making them fail. However you can reduce the problems by taking care of your hearing aids with a clean and care routine. All hearing aids are returned with a 6 month warranty. We utilise the services of the leading hearing aid manufacturers and a selection of specialist hearing aid repair centres to provide this valuable service. Repair costs are typically £70-£95. Most high street retailers charge £150-£190 for a repair,up to double what we charge. We are able to provide this service to hearings aids from every hearing aid manufacturer based in the uk. The environment in the ear canal is 100% humidity and remains at a constant 37 degrees Celsius. Earwax is a combination of salt and corrosive body acid. These conditions are harmful to electronics, but this is the environment that hearing aids must perform. If your hearing aids have not been checked for 2 years, then they may not be functioning at their best, as the microphone, speaker and microchip gradually become contaminated. We can have your hearing aids serviced bringing them back to peak performance. 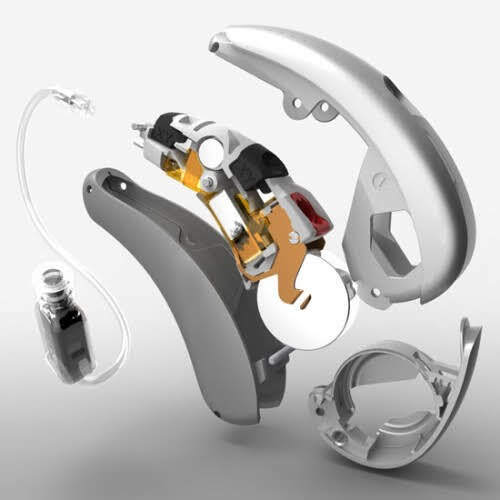 Our chosen repair laboratory will replace the working parts as necessary and return the hearing aids to you with a full 6 month repair warranty. Here are five tips from Widex to help you keep your hearing aid working. Keep them clean: Whatever the type of hearing aid, water or other fluids should never be used to clean them. Clean the surfaces of the hearing aid with a soft, dry cloth, use the special brush and tool supplied with the hearing aid to brush away any wax or debris around the sound outlet, microphone opening and vent. Keep them safe: Lean over a table when inserting and removing your hearing aid. Hearing aids can easily be damaged if they fall on the hard floor. Keep them snug: Hearing aids should never be exposed to high temperatures or moisture. Don’t wear your hearing aids while showering, swimming, during radiation treatment, or when using a hair dryer. Use a drying kit regularly, there are electronic drying stations available to dry out your hearing aids that you can use at night. Keep in touch: Your level of hearing loss may change over time, which means that your hearing aids will have to be adjusted to meet your new hearing needs. It’s important to keep in touch with your hearing professional and have regular hearing evaluations to get the most out of your hearing aids. Keep your batteries fresh: Open your hearing aid battery door when you aren’t using it to assure that your device isn’t using power when it’s not in your ear. Unopened hearing aid batteries should be stored in a dry place at room temperature – like a drawer. It is not necessary to store them in a refrigerator! If you are still having trouble with your hearing aid after going through the checklist call us on 0800 1 69 68 62 to arrange an appointment to discuss your hearing aid repair options. How Much Do Hearing Aid Repairs Cost? (2) The extent of the damage done to the hearing aid. (3) The cost of replacement parts for your hearing aid. If your hearing aid is still under warranty, your hearing aid repair costs will probably be free, however it depends on the circumstance and type of damage. Out of warranty or older hearing aids that require substantial repair may cost more. Cracked cases on custom in the ear devices can be expensive to replace, but in some circumstances, these cracks can be repaired. Your hearing aid is five or more years old, the life span of hearing aids is about five to seven years. So if you’ve reached that period and are experiencing problems, it may be time to retire your technology. If your hearing aid has been stepped on, smashed, or damaged in a way that seems unfixable, it probably is.. Your hearing aid has been repaired several times in the past, a history of repair means a history of breakage—and history has a habit of repeating. While a new hearing aids may cost more upfront, it can more than balance out the cost and annoyance of regular repair. We may be able to repair or at the very least least diagnose the problem with all makes and models of hearing aids. If you are having trouble with your hearing aids, we’d be more than happy to help you get them back in working order. Call us on 0800 1 69 68 62 to arrange an appointment and find out what options are available to fix your broken hearing aid. "The Finest Hearing Aids In The World Need Not Cost The Earth"
Boots Hearing Care, Hidden Hearing, Amplifon & Specsavers. Are You Looking For a Hearing Test or The Very Latest Hearing Aids in Scotland? We offer hearing tests and hearing care in your own home across Scotland. It allows you to have a hearing test in the comfort of your own home in the surroundings that you are familiar with.